Michael Gove appears to have been reading George Orwell's 1984 before he came up with the "free school" name rather than his more usual Dryden. In the novel "freedom is slavery" is one of the slogans of "the Party"and things are called by deliberately mis-leading names, so the Ministry of Peace concerns itself with war and the Ministry of Plenty with poverty. The "free school" epitaph is just as mis-leading as free schools are anything but free. To start with they cost a fortune to establish and run. 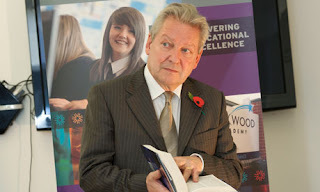 Sir Bruce Liddington, the boss of Academy and Free School chain E-act is paid a total renumeration package of £280K a year. This is more than the salary of Andrea Hill the former CEO of Suffolk County Council that caused a huge outcry earlier this year across the County. And E-Act currently run just 11 schools. The incoming CEO of Suffolk has to make do with £155K. "It's not up to me to decide what I'm paid. It's a matter for the board who invited me to show an interest in the job." In Suffolk there are already excess school places and opening new schools seems to make no economic sense whatsoever. They have diverted funds from much needed building projects to complete the school organisation review change to two tier and also meant that all local schools have had significant reductions to their capital funding. And the other sense of "freedom" is even more mis-leading. Gove bills free schools as being "free" from local authority "control". It is true that they are free from any local control and accountability as they answer directly to him personally at the Department for Education in London. And many of these "free schools" billed as schools set up by "local" parents and teachers are in fact run by chains where the Headteacher is accountable to a Board of Directors that could be hundreds of miles away or even abroad. The free school set to open in Brandon on the Breckland Middle site is currently choosing from a shortlist of three chains to actually run the school. The role of the Governing Body looks set to be more of managing a contract than actually governing the school. Sadly parents seem to have been hoodwinked into trading local accountability for "choice" and in Suffolk for sentiment - "saving" the Middle Schools. But these schools are nothing like the Middle Schools they replace. Compare this to local maintained schools where the Head is accountable to the local Governors of the School and to the Local Authority. Which has the most freedom in reality? In which school does the Head have the most power? With the success of local management of schools your local school pretty much ran itself with the local authority responsible for strategic decisions and support services. Schools did not need to be "set free" from this. Running a school should be more than managing a contract. Either inadvertently or by deliberately the proposers of these schools are complicit with a deliberate programme by the Government to privatise our schools. To remove local accountability and replace it with governance by a corporate chain with a string of highly paid executives. And this is sold as empowering local communities and giving more power to parents, teachers and the local community? What is frightening is that so many seem to believe it.